The Ather S340 is a unique product that will be introduced in the Indian auto market from Ather Energy. This electric powered scooter is a smart and stylish in design. It uses the digital battery system, which gives more control and feedback. It offers higher energy density to propel the scooter. The S340 also has an android base smart touchscreen dashboard with navigation facility, riding modes, customized profile, vehicle chasing and reverse mechanism. Some other additional features include theft detection, auto-indicators and remote supervision of charging on mobile app. Ather S340 is an electric scooter being offered by the domestic electric vehicle company. The company takes the hints from the motorcycles to make the design of the e-scooter. The Ather S340 scooter gets a dynamic shape that features lines and curves flowing smoothly around the body at the front side of the scooter. The S340 looks sporty in terms of appearance as it gets similar to a kicked style section from the rear side and a distinct- leaning position from the front side. From the front side, the electric scooter features a smart LED headlamp that automatically operates the ambient light conditions of the scooter as well as control the lighting conditions during the night time. The Ather 340 has been developed with an aluminum material that means the vehicle gets strong chassis and it won't be damaged in minor accidents. Its design is well suitable for the Indian roads and the rider can ride easily on the urban roads. The electric scooter has a weight of 118 kg which is slighter higher than the conventional scooter. The company says the Ather 340 is capable to deliver 60km in Eco mode and 60km in Eco mode in the real world conditions. As per the company, the Ather 340 can run faster up to 0- 40kmph only in 5.1 seconds at a top speed of 80kmph and can easily climb 15-degree steep gradients. 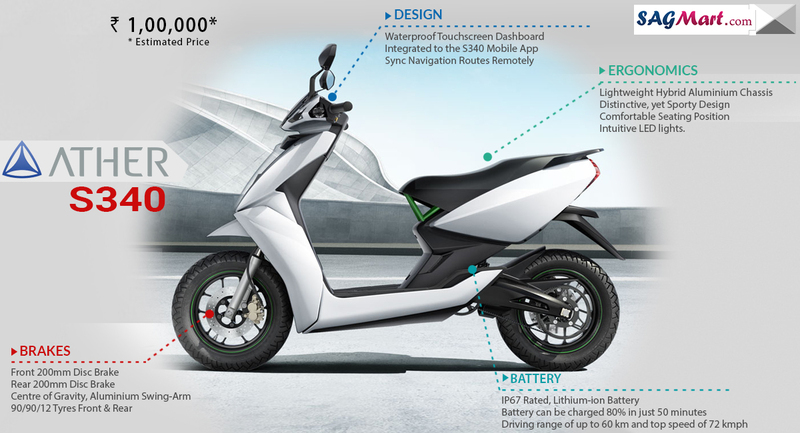 The Ather 340 is one of the most technologically advanced electric scooters so far that is available for purchase in India at Rs 1.10 lakh (Ex-showroom Delhi). The Ather 340 is facing competition with Okinawa Praise and 22 Motors Flow in electric vehicles segment.